19 JANSSON, J. Turcicum Imperium. Amsterdam, 1639-1649. Col. d'�poque. Fente le long du pli central et d�chirure sur 5 cm restaur�es. P�le mouillure dans la partie sup. Paper very slightly age toned, as usual. Repaired split and tear (5 cm) in lower part center fold. 410 x 520 mm. 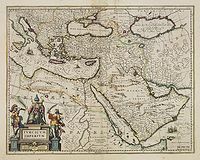 � Carte de l'Empire Ottoman orn�e d'un cartouche repr�sentant le Sultan sur son tr�ne. Texte en fran�ais au verso. 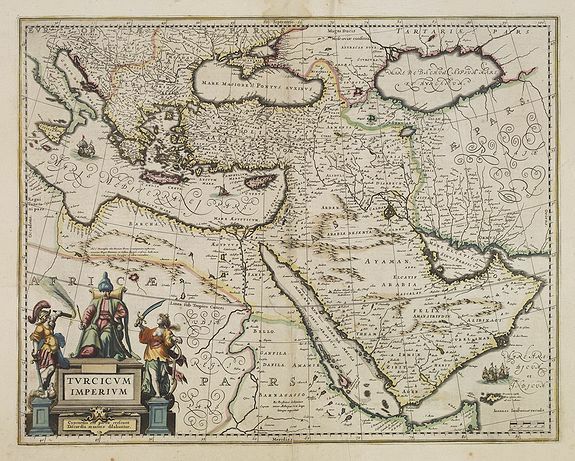 - A very handsome map with a particularly fine cartouche showing the Turkish Sultan on his throne and allegorical figures at either side brandishing weapons. Sailing ships can be seen in the Arabian Sea and the Mediterranean. The geography is reasonably accurate for the time with many place names given. Armenia and George ("Giorgia") are named. 20 GRASSL, J. Neuste Special-Kartes der Europ�ischen Turkey in IV Bl�ttern. Bibliograph. Institut in Hildburghausen, 1866. Limites en col. d'�poque. Carte divis�e en 36 segments mont�s sur toile. Etui restaur� avec du papier marbr�. Quelques taches brunes. 680 x 840 mm. Carte de la Turquie d'Europe. En carton : Gr�ce avec Candie, Silistria, d�troit des Dardanelles, le Bosphore avec Constantinople et plan de Constantinople. 21 HONDIUS, J. / JANSSON, J. Cyprus Ins. Amsterdam, 1639-1649. Beau col. d'�poque. Petite fente restaur�e en bas du pli central. Bel exemplaire. - Repair of split lower part centre fold. In original colours. 350 x 488 mm. � Carte orn�e de six cartons comprenant les �les suivantes : Stalimini I.; Chius Insul. ; Mitilene Ins. ; Negroponte In. ; Cerigo Insul. ; Rhodus Ins. Texte en fran�ais au verso. 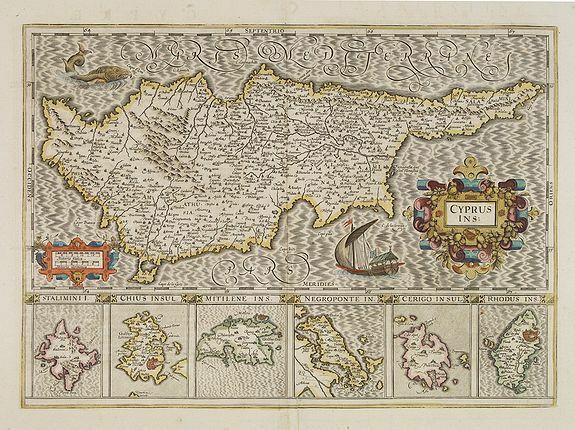 - A decorative map of Cyprus with insets for the other six islands including Chios and Rhodes. French text en verso. - Zacharakis, 2211.